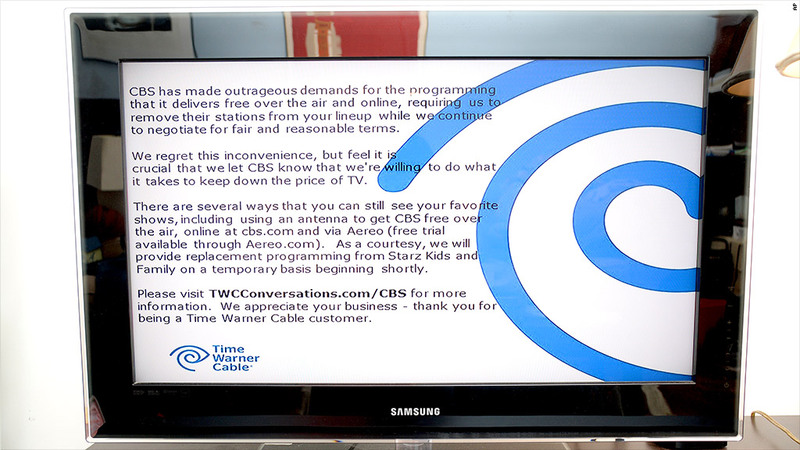 The dispute between Time Warner Cable and CBS led to a month-long programming blackout. Time Warner Cable lost a startling 306,000 television subscribers in the third quarter, and the company said part of that drop was due to its month-long fight with CBS. The TV subscriber losses, which Time Warner Cable revealed in its quarterly report Thursday, were much higher than Wall Street expected. Nomura analyst Adam Ilkowitz said he was "shocked" by the steep figure. Ilkowitz estimates that about 100,000 to 150,000 of the quarter's subscriber losses were due to the CBS blackout. The company didn't specify how many TV subscribers canceled because of the CBS blackout, but Time Warner Cable did acknowledge in its report that the dispute "negatively impacted" subscriber numbers. Analysts expected some degree of fallout from the contentious battle, which centered around how much Time Warner Cable (TWC) should pay CBS (CBS)for the right to transmit its programming. The war hit customers Aug. 2, when the cable provider pulled CBS stations off the air in several cities. That affected three million customers in cities where CBS owns the affiliate stations that carry the network. Time Warner Cable customers nationwide lost access to three CBS-owned premium cable networks: Showtime, The Movie Channel and The Smithsonian Channel. The two companies finally came to an agreement in early September, a few weeks before the quarter ended. But that was too late for many Time Warner Cable subscribers. "We hope to hear more on how TWC will 'get back up,'" Ilkowitz wrote in a note to clients. Time Warner Cable now has 11.4 million TV subscribers. The CBS battle affected Time Warner Cable beyond subscriber losses. The company was forced to issue $15 million in credits during the quarter to customers who paid for the CBS-owned premium channels like Showtime.